Welcome! I created this Christmas card for the challenge at Tuesday Morning sketches. I chose snowflakes when I saw this whimsical sketch...maybe I was influenced by Carol and Janee's cards. 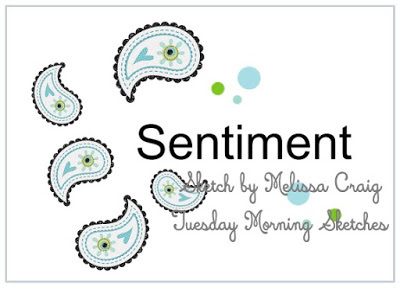 I used Gina K Design stamps and a die from Seasonal Sentiments set. 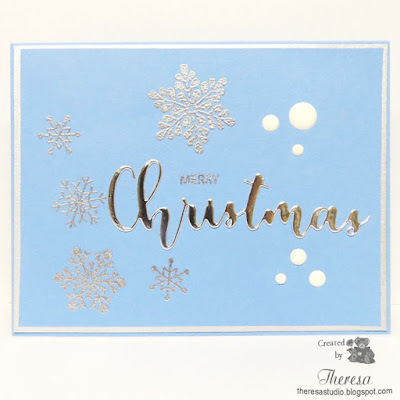 I stamped the snowflakes and word Merry with Versamark on GKD Powder Blue CS and heat embossed with Hero Arts Silver EP. Attached the word Christmas die cut from Silver Metallic CS and some White enamel dots to finish. Edged the panel with Silver Metallic Marker before adhering to card base of blue. A lovely CAS card and super colour choice. Thank you for joining our 'Christmas' challenge at Allsorts. This card is beautiful and the enamel dots fit seamlessly into your design! Thanks for playing w/ us at UYS! A really pretty creation for our 'Christmas' theme at Allsorts challenge, thanks so much for joining in. Great job with the sketch. This is such a pretty card! Thanks for joining in our enamel dot challenge this week and hope to see you again! The silver and blue look gorgeous together, such a beautiful CAS card! Thank you so much for joining us at Allsorts challenge this week! Absolutely gorgeous!! I love the silver embossing!! CAS yet elegant! If I played a part in influencing you to make this stunning card, I am truly honored! This is so pretty with great colors and I love the addition of the white enamel dots in the mix! Thanks for playing along with the Tuesday Morning Sketch challenge, and we hope you'll join us again next week too! This is simply beautiful Theresa!! I'm so glad you joined us this week at Tuesday Morning Sketches!! Gorgeous card! Your card is being featured at Use Your Stuff this week! Congrats! Please stop by and get a badge for your blog. Hope you join us again at Use Your Stuff Challenge Blog! Gorgeous card. The embossed snowflakes are lovely with the blue background. Thank you for joining us at Tuesday Morning Sketches.